Delve into the brilliant yet tormented history one of the most famous Dutch artists of all time with a private, 1.5-hour tour of the Van Gogh Museum in Amsterdam. Explore the collection chronologically with a professional art historian and educator, learning about the events that shaped Van Gogh’s life and inspired his groundbreaking work. Price is per group, based on a maximum of six people. Das Van Gogh Museum ist einer der wichtigsten kulturellen Schätze Amsterdams. Holen Sie das Beste aus Ihrem Besuch heraus, indem Sie die umfangreiche Sammlung mit einem Reiseführer erkunden, der über jahrzehntelange Erfahrung in Bildung und Kunstgeschichte verfügt. Dies macht dies zu einer großartigen Erfahrung für Erwachsene und Kinder im Schulalter. 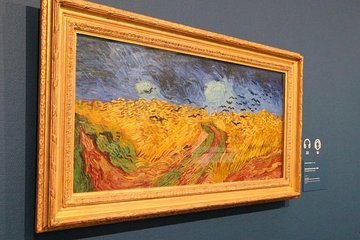 Treffen Sie Ihren Führer am Morgen im Stedelijk Museum nebenan, gehen Sie dann zum Van Gogh Museum, bezahlen Sie Ihre Eintrittspreise und treten Sie ein. Sehen Sie die Entwicklung von Van Goghs Arbeit auf einer chronologischen Tour, angefangen bei seiner frühen Nuenen-Phase "Potato Eaters" bis hin zur Teilnahme an der Pariser Impressionist-Bewegung. Bewundern Sie einige seiner ikonischsten Gemälde in einer Galerie, die seinem goldenen Zeitalter in Arles gewidmet ist, und bezeugen Sie die Auswirkungen seines abnehmenden Gemütszustandes mit schönen, aber unruhigen Werken, die in St. Remy und Auvers-sur-Oise am Ende seines Lebens entstanden sind. Sehen Sie sich während der 1,5-stündigen Tour die wichtigsten und interessantesten Stücke der Sammlung an und erfahren Sie mehr über reale Orte und biografische Ereignisse, die sie inspiriert haben. Nachdem Sie sich von Ihrem Reiseführer verabschiedet haben, können Sie das Museum auf eigene Faust weiter erkunden. We had a wonderful private tour of the Van Gogh museum from Drs Kees Kaldenbach - he has written a book about Van Gogh and offers insightful observations throughout along with putting Van Goghs life and experiences in context. The weave of knowledge and speculation allow even light-art folk like ourselves to engage with the material and gain a deep understanding in an effortless 2 hour stroll. We moved directly to the front of the line and were first into the museum and had unfettered access as we strolled almost alone discussing the works. Kees is delightful and customizes his approach to the audience, at once answering the most banal and basic and the more ambiguous and complex with the same interest and concern. His upper end of knowledge was certainly untested by us, however his depth and breadth of knowledge and his friendly demeanor made us feel like experts by the end of the tour! My highest recommendation! This was a highlight of our trip. We got to see all of the best paintings before the crowds poured and then had time to go back at our leisure and do the studio tour. A great museum and a great tour. IMO, this is the ONLY way to see the Van Gogh museum. Kees the guide speaks perfect English and his expertise is both engaging and comprehensive. I learned so much more than I expected and it was fascinating. He combines all aspect of Van Gogh's craft -- his personal history, his family, his artistic influences, the development of his skill as an artist, the time in which he lived, etc. I HIGHLY recommend this tour. It costs more than the group tours, but there is absolutely no comparison!